Mitch Keller does not have any MLB stats for the season. Draft: 2014, Pittsburgh Pirates, 2nd rd. Mitch Thomas Keller…Is a 2014 graduate of Xavier High School in Cedar Rapids, IA, the same school that produced big league outfielder Ryan Sweeney… Was ranked as the No. 1 baseball prospect in the entire state of Iowa and ranked No. 31 of all prospects nationally by Perfect Game…Added nearly 10 mph to his fastball between his junior and senior seasons...Was committed to play collegiately at the University of North Carolina, but decided to forgo his scholarship after signing with the Pirates...Helped victims when flooding struck southern West Virginia when he played for the Power in 2016…His older brother, Jon, is a right-handed pitcher who pitched five seasons in the Colorado Rockies organization between 2013-17...Was signed by Pirates scout Matt Bimeal. Entered season ranked by Baseball America as Pittsburgh's No. 1 prospect; was also tabbed by the same publication as having the "Best Fastball", "Best Curveball" and "Best Control" in the Pirates minor league system... Also listed as the organization's top prospect by MLB. com...Split season between Double-A Altoona and Triple-A Indianapolis...Also made one start with High-A Bradenton on 7/10 while Indianapolis was on its All-Star break...Went 12-4 with a 3.48 ERA (142.1ip/55er) and 135 strikeouts in a career-high 25 starts between the three teams...Also set minor league career highs in wins, innings pitched and walks (55)...Began season with Altoona and won nine of his 14 Double-A starts before being promoted to Triple-A on 6/28...Ranked fourth in the Eastern League in ERA, first in wins, third in innings pitched (86.0) and fourth in batting average against (.208) at the time of his promotion...Went 4-0 with a 0.69 ERA (26.0ip/2er) and a 0.81 WHIP in his final four starts with Altoona between 6/6-25...Gave up a career-high eight runs in 2.2ip while making his Triple-A debut on 6/30 at Columbus (no-decision)...Suffered first loss with Indy in his next start on 7/5 vs. Louisville (6.0ip/5er)... Was transferred to Bradenton during the Triple-A All-Star break and made lone outing with the Marauders on 7/10 (4.0ip/2r/1er)...Earned his first Triple-A win on 8/9 vs. Lehigh Valley...Went 3-1 with a 2.86 ERA (34.2ip/11er) in six starts during the month of August. Entered season ranked by Baseball America as Pittsburgh's second-best prospect and as having the "Best Curveball" in Pittsburgh's minor league system...Also listed as the No. 22 prospect in baseball and No. 6 RHP prospect by MLB.com...Went 8-5 with a 3.03 ERA (116.0ip/39er) and 116 strikeouts in 23 total starts at three different levels of the organization...Ranked third among Pirates minor leaguers in ERA and fourth in strikeouts...Began season with High-A Bradenton and was selected to the Florida State League mid-season All-Star team...Was named the Florida State League Pitcher-of-the-Week for the week of 5/1-7...Missed a month of action with a back injury between 5/17 and 6/18... Made two starts with Morgantown-WV on 6/19 (2.0ip/0r) and 6/24 (2.0ip/0r) before returning to Bradenton on 6/29...Was promoted to Double-A Altoona on 8/5...Made Double-A debut on 8/6 at Trenton and allowed two runs in the fifth inning in no-decision...Recorded a career-high 11 strikeouts over 6.0 scoreless innings in a win in his final regular season start on 9/1 vs. Harrisburg...Threw 90 pitches and faced the minimum in a 9.0-inning shutout over Bowie in Game One of the Western Division Series on 9/7 (gave up one hit and two walks while striking out four)...Pitched championship-clinching Game Three of the Championship Series on 9/14 vs Trenton; allowed two runs (both in the second inning) and four hits in 7.1 innings while striking out eight batters in the 4-2 victory...Was named Eastern League Postseason Most Valuable Player after going 2-0 with a 1.10 ERA in two starts...Was ranked by MLB.com as Pirates' No. 2 prospect following season...Participated in the Arizona Fall League and went 4-0 with a 1.52 ERA (23.2ip/4er) in six starts with Glendale...Was named to the league's Fall- Star's Game and was the starting pitcher for the West team (2.0ip/1h/1r/1er/2bb/0so)...Was named the best starting right-handed pitcher in the Arizona Fall League after leading the league in wins and ranking fifth in ERA...Was one of three starting pitchers named to the Arizona Fall League's Top Prospects team. Was named Pittsburgh's Minor League Pitcher-of-the-Year after going 9-5 with a 2.35 ERA (130.1ip/34er) and a career-high 138 strikeouts in 24 starts...Made all but one of his starts with Single-A West Virginia, where he was named to the South Atlantic League mid- and post-season All-Star team...Was also named the South Atlantic League's Most Outstanding Pitcher and the "Best Right-Handed Pitcher" at the end of the year...Ranked second in the South Atlantic League in ERA and batting average against (.211), first in WHIP (0.92) and fewest baserunners per 9.0 innings among starters (9.05) and third in strikeouts per 9.0 innings among starters (9.48)...Was named the South Atlantic League Pitcher-of-the-Week for the week of 4/7-17...Was named the South Atlantic League Player-of-the-Month for April after going 2-1 with a 0.86 ERA in four starts; also allowed just 12 hits, walked one and struck out 28 batters while posting a .167 batting average against...Was the starter and winner for the North Division in the South Atlantic League All-Star Game on 6/21...Finished third in West Virginia single-season history in strikeouts, trailing only Tyler Glasnow (164 in 2013) and Will Inman (134 in 2006)...Ranked second among Pirates minor leaguers in strikeouts and fourth in ERA... Was charged with just three earned runs over his first 41.0 innings of work (0.79 ERA) to start the season…Had a season-high 10 strikeouts twice in 5.0ip each time; 4/11 at Greenville and 4/22 at Lexington...Allowed three earned runs in five starts during the month of August (26.2ip - 1.01 ERA)…Finished his campaign with West Virginia on a 23-inning scoreless streak...Was promoted to Bradenton on 8/30 and pitched 6.0 scoreless innings in his lone start with the Marauders on 8/30 vs. Jupiter...Finished the year with a 29-inning scoreless streak. Was ranked by Baseball America as Pittsburgh's ninth-best prospect entering the season...Spent entire season with short-season Bristol…Did not debut until 8/2 because of right forearm tightness…Was charged with more than one earned run just twice in his six starts; gave up two runs on 8/8 and a career-high seven runs in 2.0ip on 8/21 at Princeton. Made professional debut with the Gulf Coast League Pirates after being selected in the second round of the First-Year Player Draft on 6/5...Did not allow a run in his first two outings (5.0ip)...Made his only professional relief appearance on 7/11 and tossed 3.0 scoreless frames...Did not surrender an earned run in six of his nine outings...Was not charged with an earned run over four starts (14.2ip) between 7/31 and 8/18. 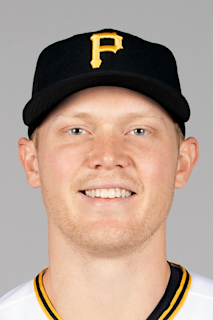 March 9, 2019 Pittsburgh Pirates optioned RHP Mitch Keller to Indianapolis Indians. November 20, 2018 Pittsburgh Pirates selected the contract of RHP Mitch Keller from Indianapolis Indians. July 18, 2018 Indianapolis Indians activated RHP Mitch Keller from the temporarily inactive list. July 14, 2018 Indianapolis Indians placed RHP Mitch Keller on the temporarily inactive list. July 11, 2018 RHP Mitch Keller assigned to Indianapolis Indians from Bradenton Marauders. July 10, 2018 RHP Mitch Keller assigned to Bradenton Marauders from Indianapolis Indians. June 28, 2018 RHP Mitch Keller assigned to Indianapolis Indians from Altoona Curve. March 18, 2018 RHP Mitch Keller assigned to Pittsburgh Pirates. August 4, 2017 RHP Mitch Keller assigned to Altoona Curve from Bradenton Marauders. June 29, 2017 Bradenton Marauders activated RHP Mitch Keller from the 7-day disabled list. June 19, 2017 Bradenton Marauders sent RHP Mitch Keller on a rehab assignment to West Virginia Black Bears. May 26, 2017 Bradenton Marauders placed RHP Mitch Keller on the 7-day disabled list retroactive to May 24, 2017. August 30, 2016 RHP Mitch Keller assigned to Bradenton Marauders from West Virginia Power. April 5, 2016 RHP Mitch Keller assigned to West Virginia Power from Bristol Pirates. June 21, 2015 RHP Mitch Keller assigned to Bristol Pirates from GCL Pirates. June 14, 2014 Pittsburgh Pirates signed RHP Mitch Keller. June 14, 2014 RHP Mitch Keller assigned to GCL Pirates.